Our thoughts and prayers are with the people of North Carolina. I have spoken with Dr. Ken Russell, Vice President of Digital Transformation and CIO of Pfeiffer University located in Misenheimer, North Carolina. Pfeiffer University has sustained minimal damage from Hurricane Florence and all systems are go for November. The Water 2.0 Conference: Digitally Connecting the Water Industry will focus on the use of data analytics, software, cyber security for water utilities and industrial water users. Also on the agenda will be the subject of flooding and the important issues associated with it. Participants will include water and energy industry authorities, utilities professionals and representatives from the EPA. Allison Chinchar, CNN International Weather Team Meteorologist spoke at our Water 2.0 Conference in Charlotte NC last fall on the subject of “Flooding From a Television Perspective.” We are particularly excited about welcoming Allison back as a Keynote Speaker to our event this year, as she has been on the forefront of reporting on some of the most significant water events affecting our planet in recent history. 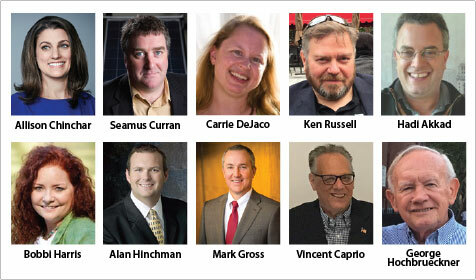 We have once again lined up a stellar roster of speakers for our upcoming Water 2.0 Conference, featuring stakeholders who are driving significant change in the water industry. We welcome you to join us at Pfeiffer University on November 8th to discuss these relevant and important water issues. Hope to see you in North Carolina. This webinar will focus on quality control in the manufacturing process and builds on the National Nanotechnology Initiative’s Technology Pathways workshop held in November 2017. Webinar panelists will engage in a dialogue about the criticality of and issues surrounding quality control in the production of nanomaterials. NNCO Director, Dr. Lisa Friedersdorf, will moderate the discussion. The nanotechnology business community and interested members of the general public, media, academia, industry, non-governmental organizations, and Federal, State, and local governments are encouraged to participate. More information about upcoming webinars is available at www.nano.gov/PublicWebinars. QEEN II: 2nd Quantifying Exposure to Engineered Nanomaterials from Manufactured Products (QEEN II) Workshop A technical workshop to highlight recent advances in characterizing and quantifying exposure to engineered nanomaterials in manufactured products. The Water 2.0 Conference will focus on the use of data analytics, software, cyber security for water utilities and industrial water users. Participants will include water and energy industry authorities, utilities professionals and representatives from the EPA. Hope you will be able to participate! You are currently browsing the Evolving Innovations weblog archives for September, 2018.